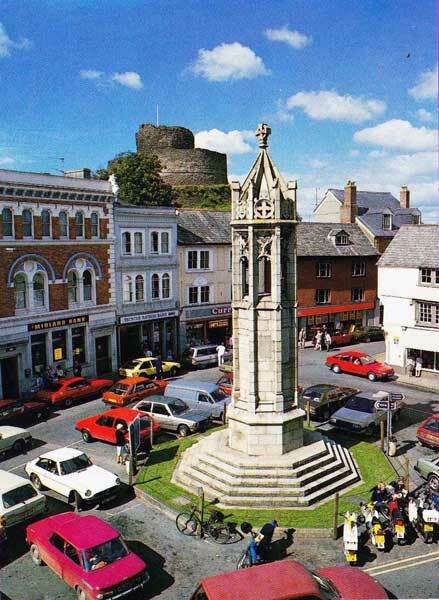 Launceston Town Centre. | Launceston Then! The tittivating barber, to frizzify their wigs. (The Duke of Northumberland. Who had been speculating in tallow at this time, had just before the election invited the local Tories to a tea, which they attended wearing white trousers with a broad red stripe down the off sides which were the then party colours). 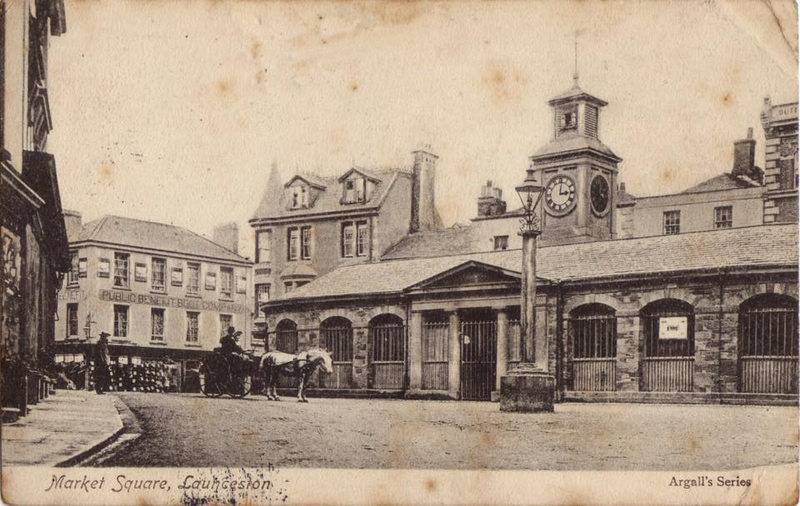 Up to 1838 Launceston was the centre for all County Court hearings which brought much trade to the town. 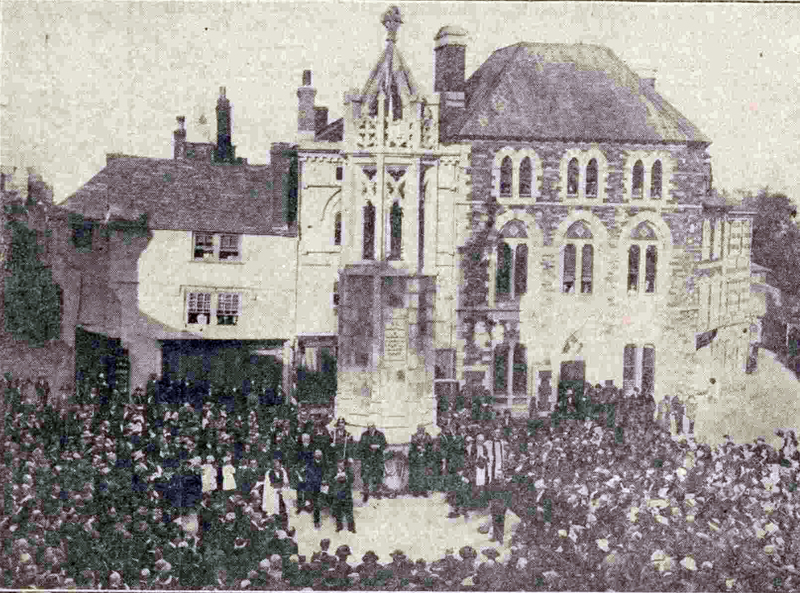 Being held in the Guildhall, which was then situated in the town centre. 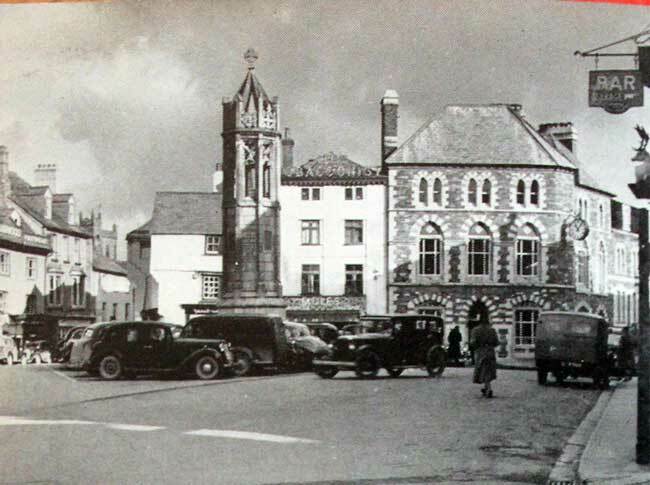 But in 1838 the town was badly hit when the assizes were closed and along with the county jail, moved to Bodmin. Lord Denham, the Lord Chief Justice of England having just sat in the Criminal Court sentencing in the last case a boy, of thirteen, to penal servitude for life on stealing three gallons of potatoes. His last observation was “ I have a word to say before I vacate my seat, I have to inform you that the new hall at Bodmin is all but completed, therefore the assizes will be held in that town in the future” . 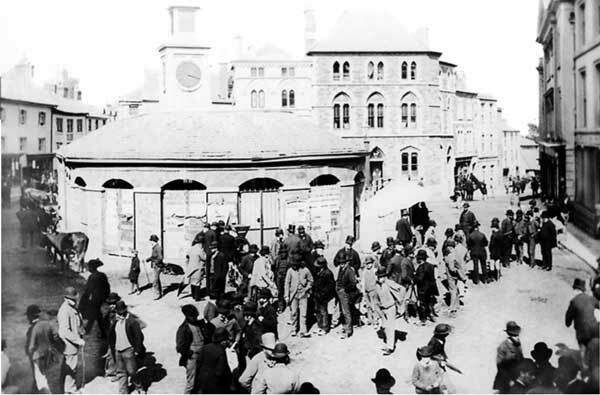 It is estimated that this move cost the town thousands of pounds in lost revenue as the various lawyers, judges, court attendants and various gentlemen held permanent residences in area. 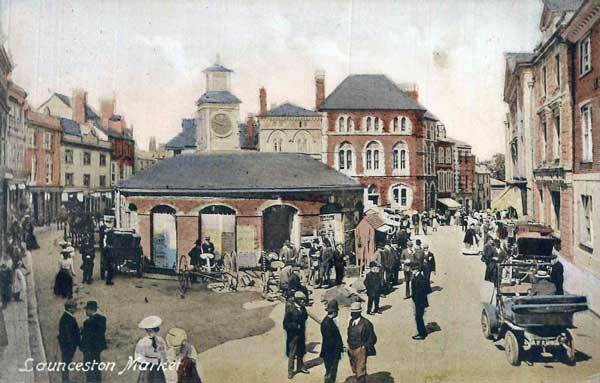 The town stagnated for the next twenty years until the arrival of the railway in 1865. 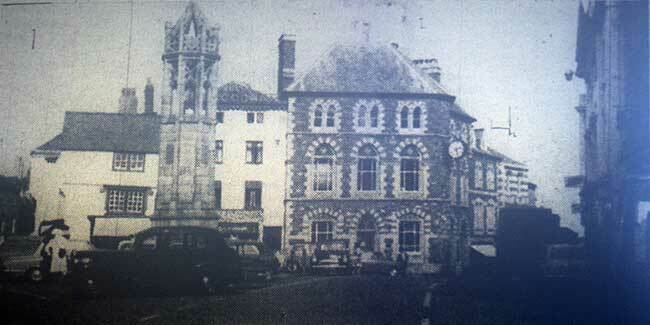 In 1840, both the county jail in the castle and the Guildhall, which dated back to 1647, were demolished. 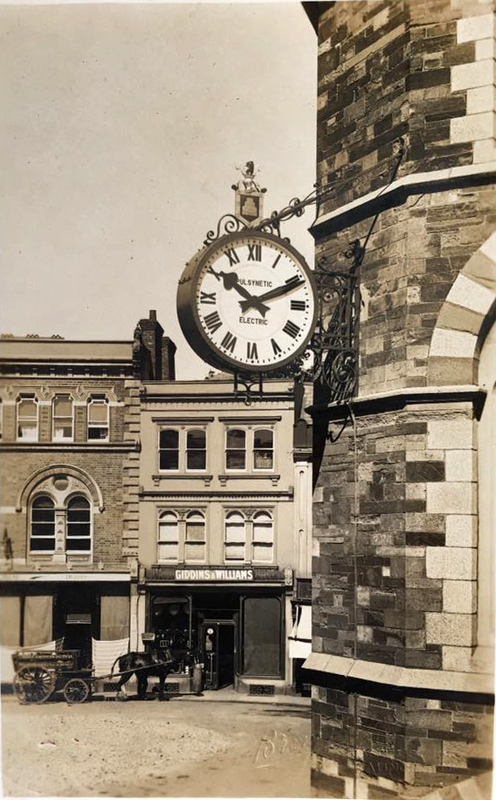 The old Guildhall clock (which was originally from Hexworthy House) was saved and eventually reused in 1881 in the new Guildhall on Western Road. 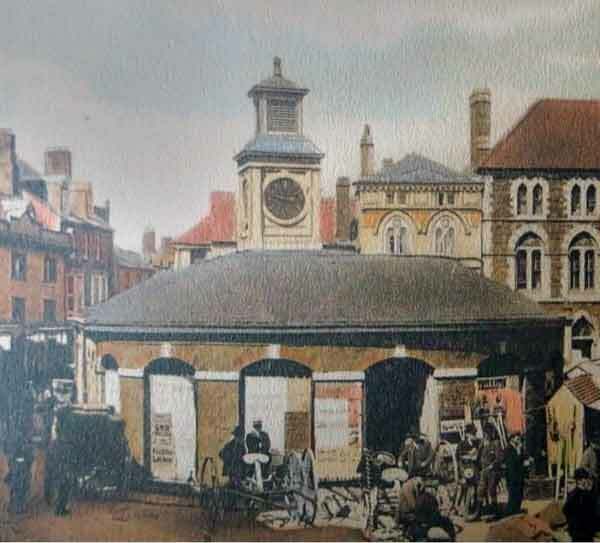 In place of the Guildhall a new market house was built, the Upper Market (corn and butter market) to a design by the architect George Wightwick. It was designed in an ‘Italian’ style, which proved to be unsuited to the Cornish climate and was unpopular to those that used it. 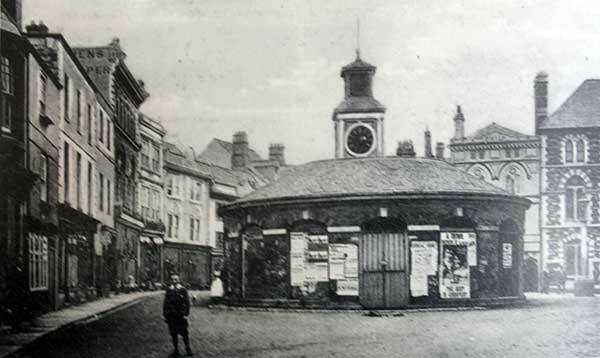 At the same time,to another design by Wightwick the Lower Market (meat market) was built near the Church Stile (Now the Market Arcade). 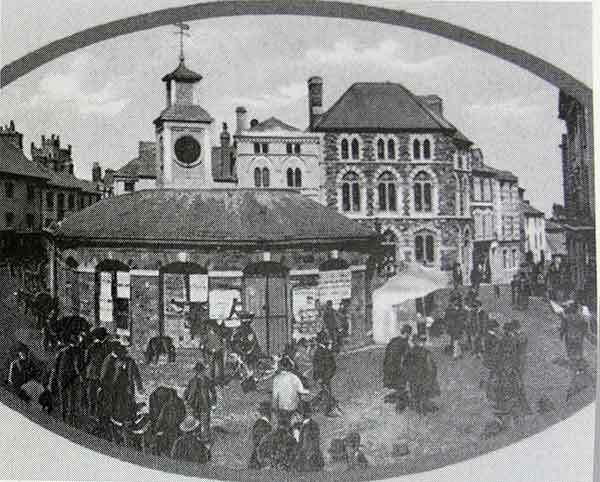 The buildings were constructed under an Act “for regulating the markets and erecting a market-house in Launceston,” which received the royal assent on June 19, 1840, and by the provisions of which the ancient connection between town and church was continued by the payment out of the market tolls of £25 annually to the incumbent of St. Mary Magdalene’s. 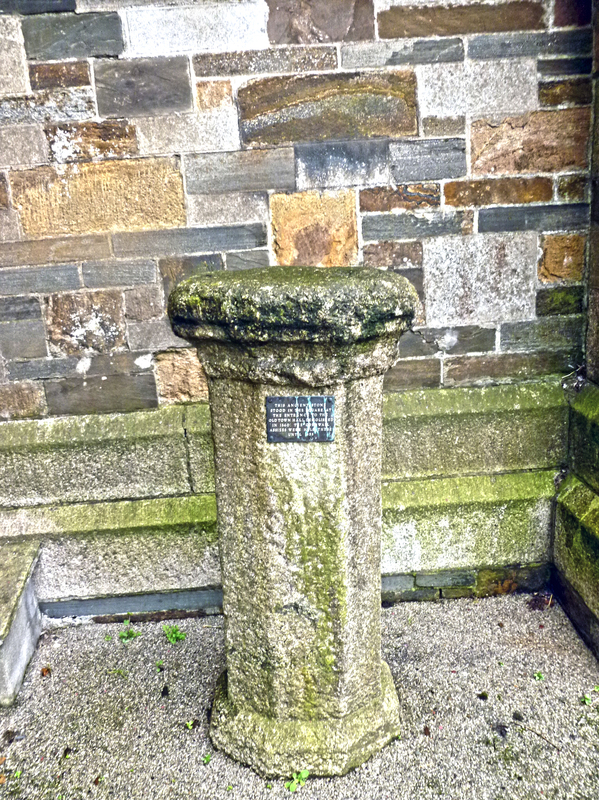 Until the passing of the Ballot Act in 1872 the hustings stood within the Corn Market, this being the only relic it possessed of the duties of the old Guildhall. 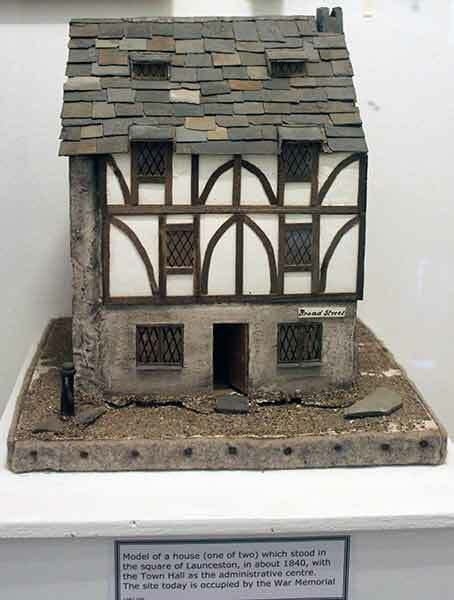 The woodwork of the old Guildhall was reclaimed and used in a new house within the town (it is not known which house this would be). 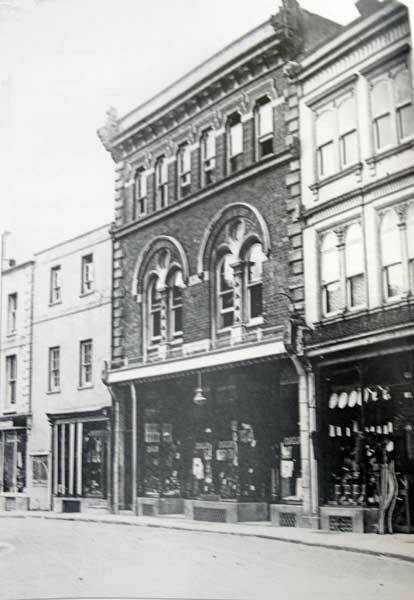 In 1870 a fire (below left and right) swept through three shops in what was then Back Lane (now part of Broad Street) destroying one shop and badly damaging two others. 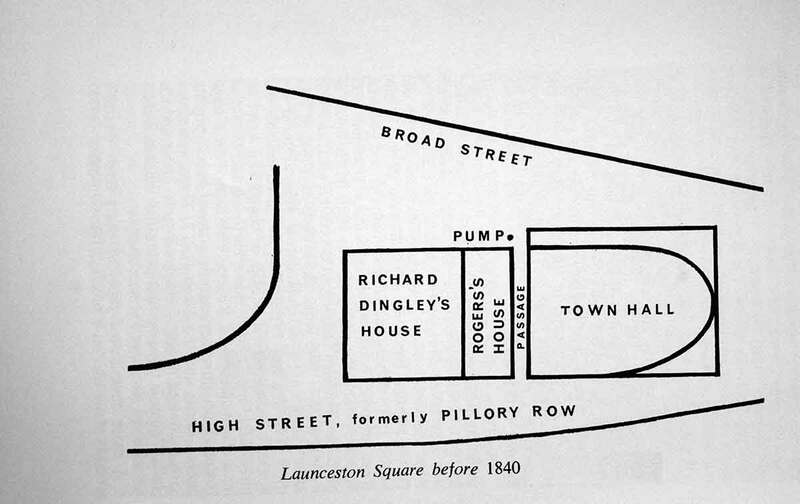 Launceston Weekly News,21 May, 1875: A fire broke out on Wednesday morning, 19th May, at Launceston, in the forage stores of Mr A Lyne, grocer and forage dealer, whose front shop was situated near the Corn Market in what had recently become Broad Street, but which was a continuation of High Street. 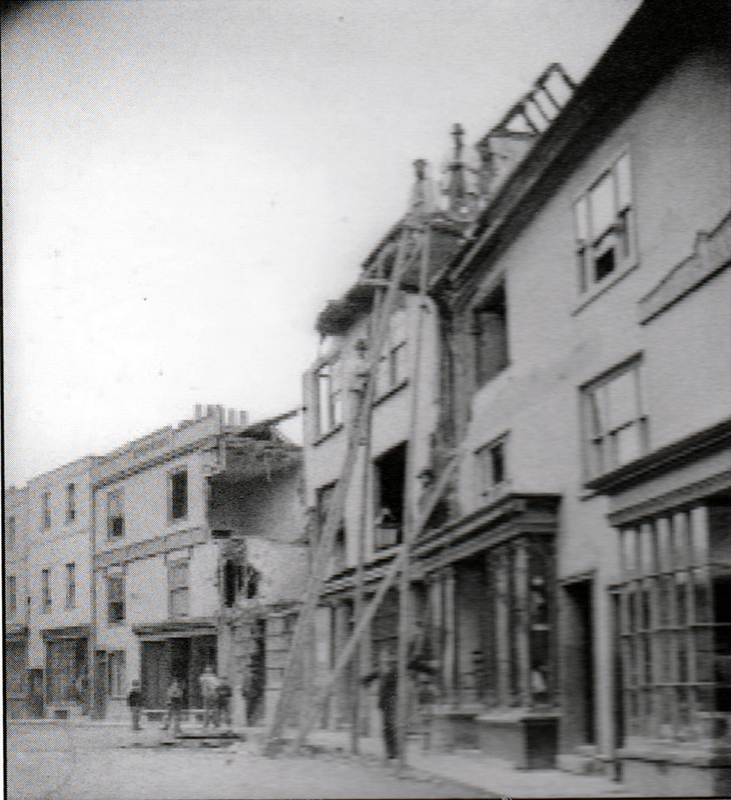 On one side of Mr Lyne’s premises was the shop of Mr Stevens, next to that being the shop of Mrs W Thomas, milliner and draper.The large fire engine, “The Volunteer,” which has been renovated and placed on high wheels, at considerable cost, was in Broad Street in ten minutes, but in a few minutes the supply of water in the reservoir was exhausted and the mechanism broke down.The smaller engine, “The Dunheved.” was taken into Castle Dyke. Great efforts were made by Mr Short, Mr Brighton, and others to get the engine working, but without success.A double line of persons was formed to pass buckets of water from pumps, the MP for the Borough, JH Deakin, Esq., also assisting. After some time the larger engine was repaired and brought into use and the fire was got under. 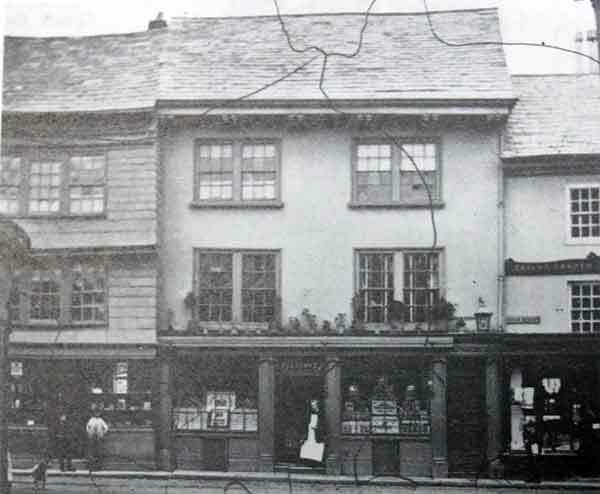 Mr Lyne’s shop had entirely disappeared down to the shop window, and in Mr Ellacott’s house the roof had disappeared. 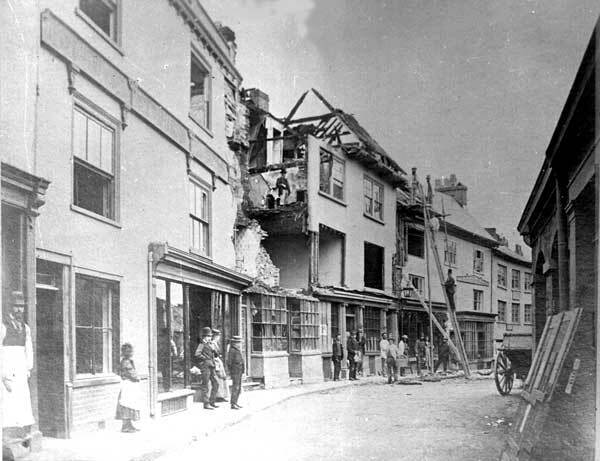 A portion of Nicholls’ house had been broken down to prevent the fire spreading in that direction. 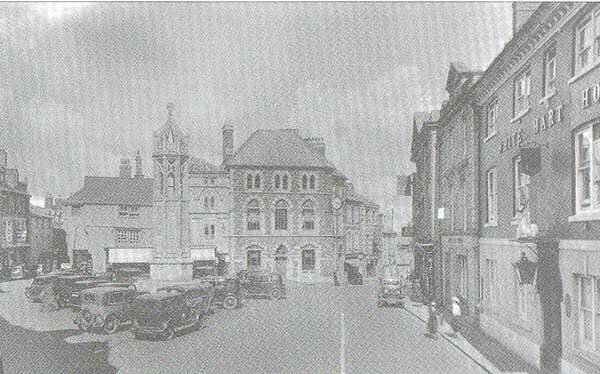 Coming back to the new Upper Market, better known as the Butter Market, this became the hub of the town for nearly eighty years including the war years, however, after the war its days were numbered. As previously mentioned, the building, with its design more akin for a Mediterranean climate, was disliked by many, so when it was suggested in 1919 that it be demolished to make way for a war memorial there was little dissent. 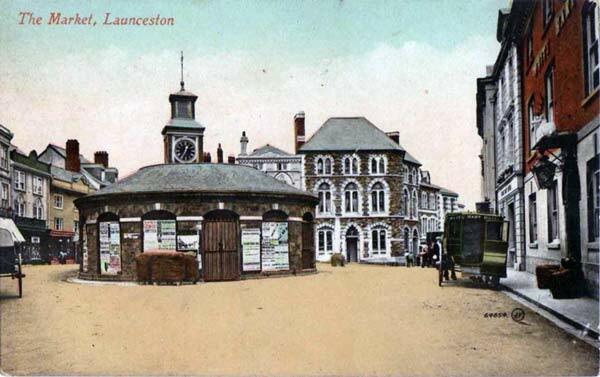 Launceston Town Centre in 1909. 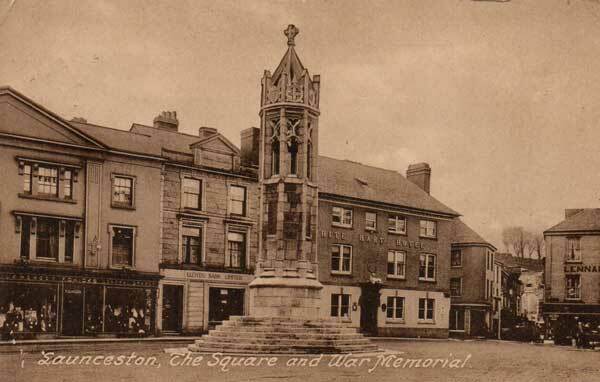 At a public meeting in January 1919 chaired by the Mayor Dr. Willie Thompson there started discussion on a war memorial for Launceston. Many suggestions were made including a Memorial Chapel at the cemetery , convalescent homes at Palscath to be run by No. 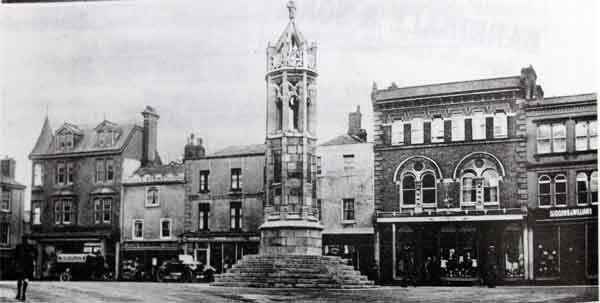 18 V.A.D., A memorial cross on the Windmill or Castle Green, a headquarters for the Boy Scouts and Girl Guides, an organ in the Town Hall, a monument on Windmill and improvements to the grounds, a Hospital for children, a sum of money to be raised and interest to be applied in maintaining the services of the District Nurse. The Rev. 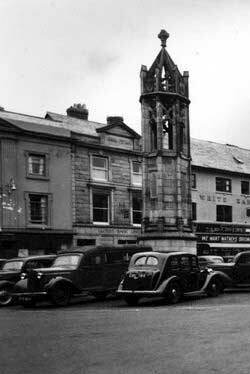 T. N. H. Smith-Pearse favoured the erection of a handsome Celtic cross as a memorial to those who had fallen, and a tablet in St. Marys Church containing their names. 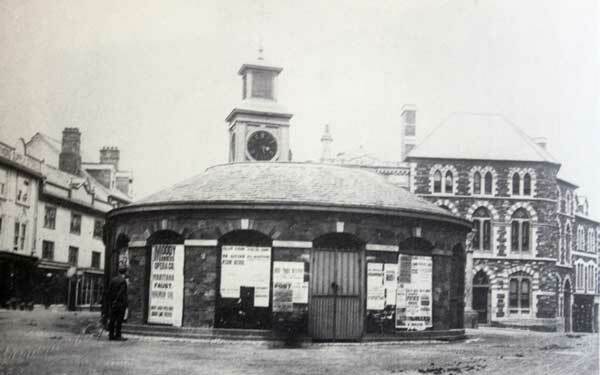 Mr. R. H. Pyne said if it were not for the financial difficulties connected with the removal of the Butter Market, he would like to see a clock tower erected on the site. He added that he favoured the idea that the memorial should be erected in some neutral spot, for the Nonconformists and Churchmen had fought and fallen side by side. The Mayor informed the meeting that there was a mortgage of £850 at present on the building and before it could be removed the consent of the bondholders and Local Government Board would have to be obtained. Mr. C. H. Peter, the Town Clerk, said the Local Government Board some years ago asked the Council to consent to a scheme for a provisional order, whereby the markets would become in charge of the district fund. This would probably mean an increase in the rates. Rev. C. M. Draper advocated a home for the dying aged poor, and thought a wing could be added to the local hospital. Mr. C. L. Cowlard agreed that this was a beautiful idea, but there were difficulties in the of linking up with the hospital. He suggested a convalescent home for a soldier and a sailor. Mr. B. B. Hardy (Headmaster of Dunheved College) advocated the founding of a scholarship for the universities. 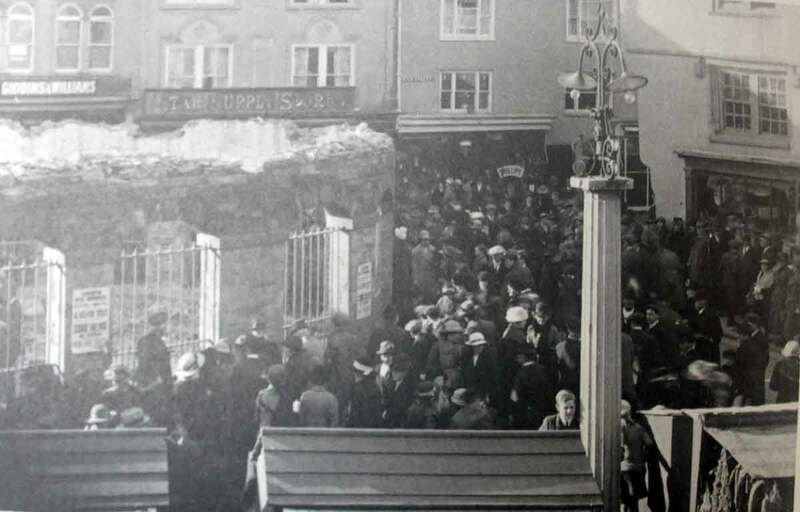 Mr. J. Kittow said the actual taking down of the Butter market was a matter for the Town Council to consider, and should not be considered as part of the memorial, to which the people would be asked to subscribe. 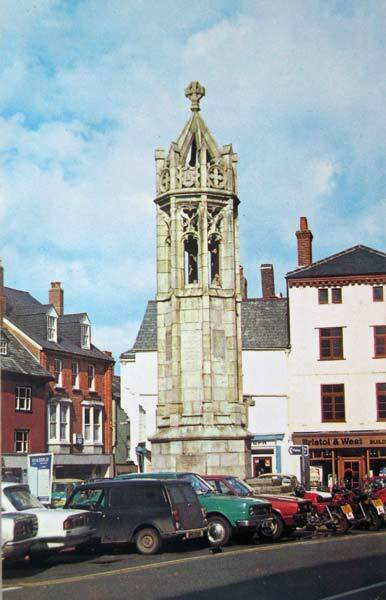 The great idea of taking down the market was that there could be no more suitable place for the erection of a memorial than the centre of that square. 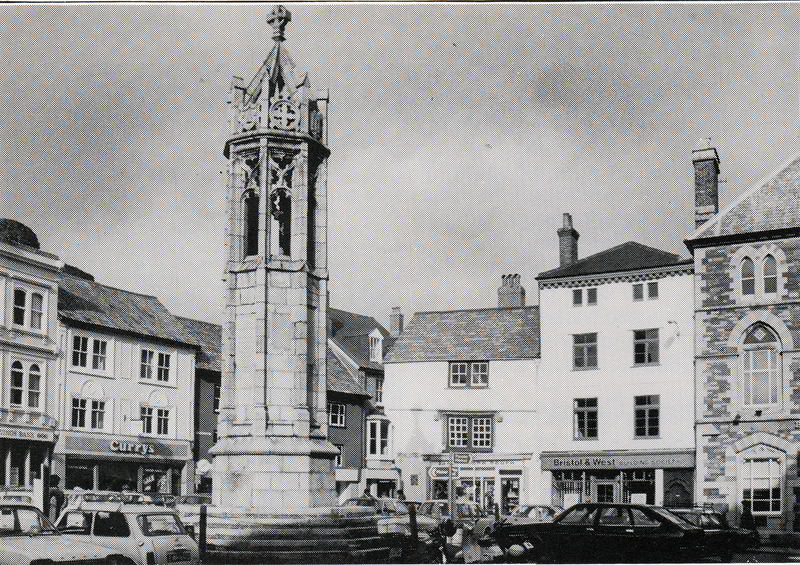 It was decided to ask the Town Council to consider whether it is feasible to remove the Butter Market, in order, if it is so desired by the town, that it may be a site for the erection of a suitable memorial. It was pointed out that this resolution did not preclude the further consideration of the other schemes suggested. 1920 public inquiry article from the Western Times. 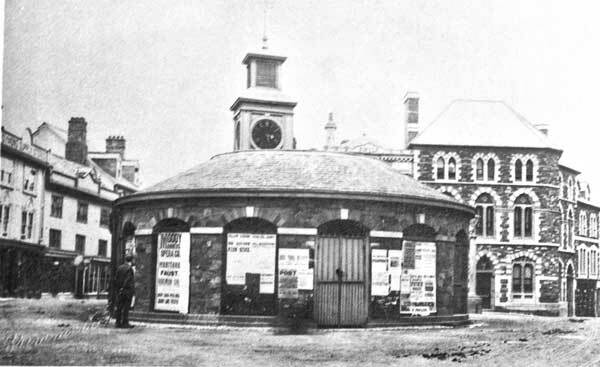 Although further meetings were held to consider the other schemes,the removal of the Butter Market became the favoured plan and so at a Town Council meeting it was decided to apply to the Minister of Health for approval to the demolition of Corn and Butter Market and for leave to borrow, upon security of the district fund and general district rate, such a sum as might be required for repayment of a portion of the existing market debt. 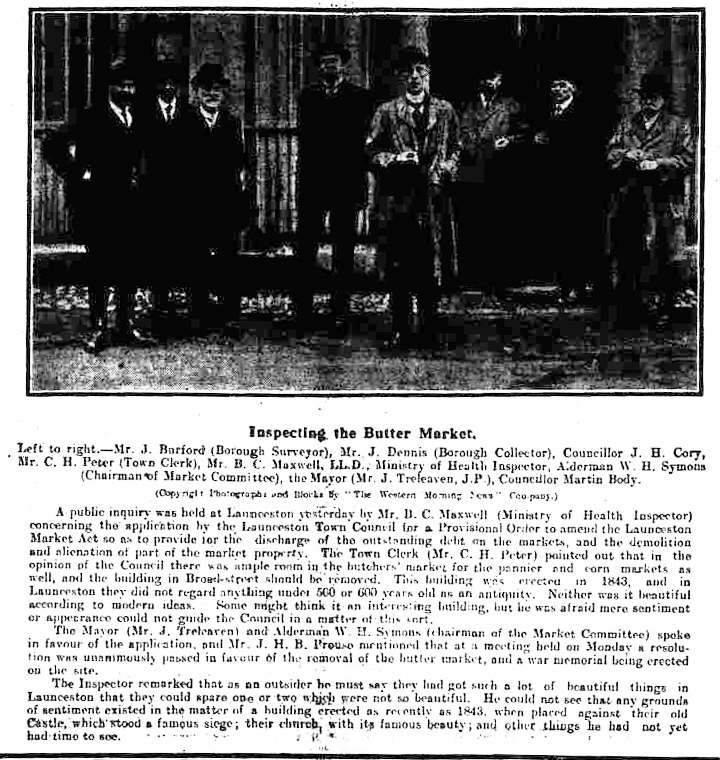 February 1920 Butter Market inquiry. 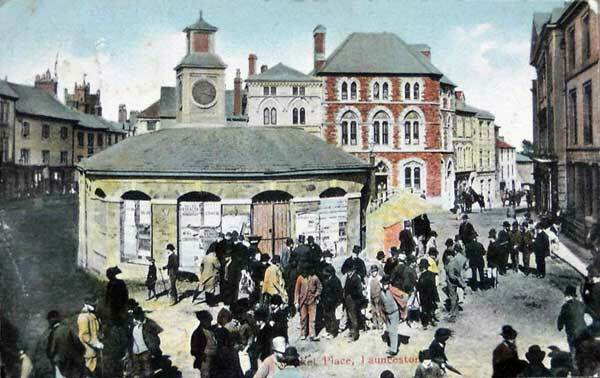 And so on the 23rd of February 1920 a Public inquiry (above) was held by Mr. B. C. Maxwell (Inspector for the Ministry of Health) to consider the Town Councils application for a provisional order under the public health act 1875, to partially repeal, alter or amend the Launceston Market Act, so as to provide for the demolition of the market property. 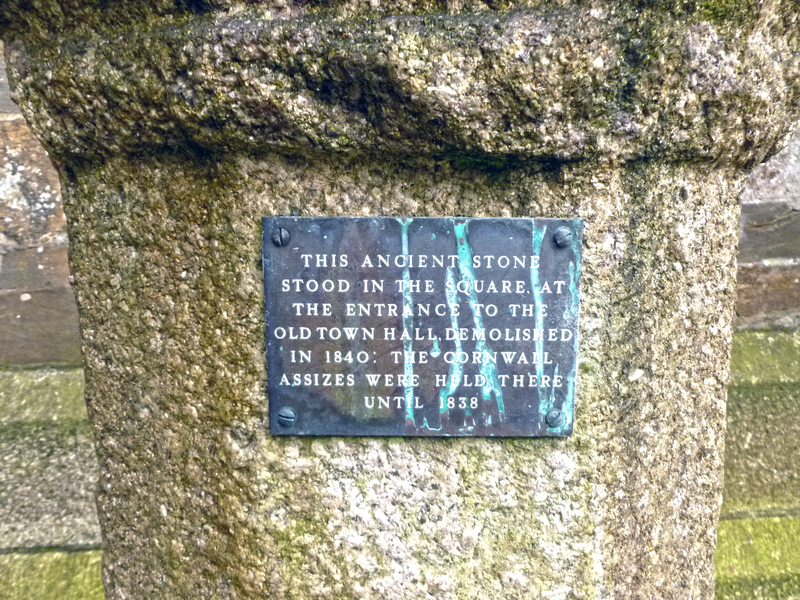 After a lengthy hearing Mr. Maxwell stated that he could not see that any grounds of sentiment existed to the matter at all in regard to a building erected as recently as 1843, when placed against their old Castle, which stood a famous siege, their Church, with its famous beauty, and other things he had not yet had time to see. 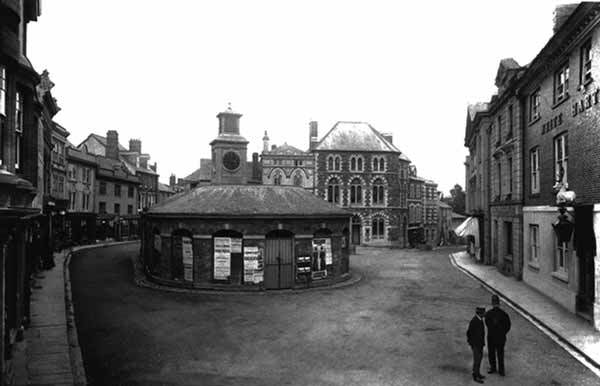 Permission was granted for the demolition of the Butter Market (below left and right). 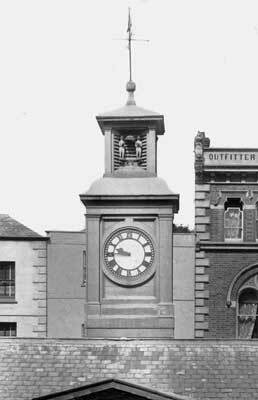 And so by the end of 1920 the Butter Market was no more, and with the contract to build the War memorial being given to the Bristol Granite Co., and a Mr. Bolt, the foundations were laid in early 1921. 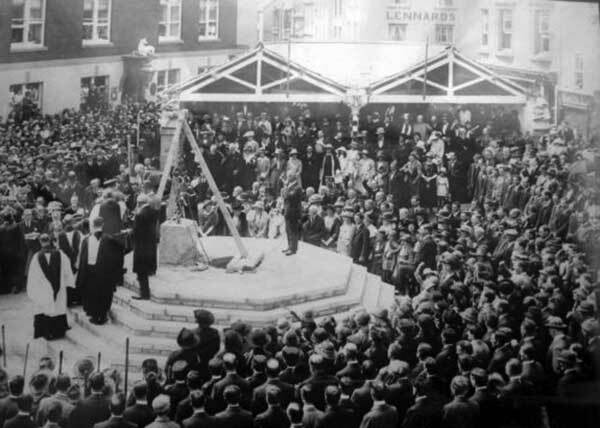 On Wednesday May the 25th 1921 the Prince of Wales, Edward VIII, layed the foundation stone and building of the memorial began in earnest (below). 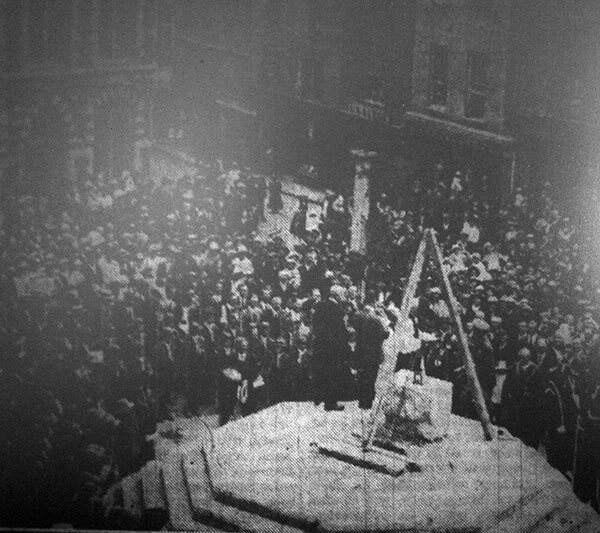 The Memorial was completed in time for its dedication in October 1921, its cost was £2000 and by the time of the dedication it was debt free! There was a minor problem before the architect Mr. Stallybrass would officially sign off the work, as he was unhappy with some of the workmanship and after arbitration Mr. Bolt was ordered to rectify the faults. 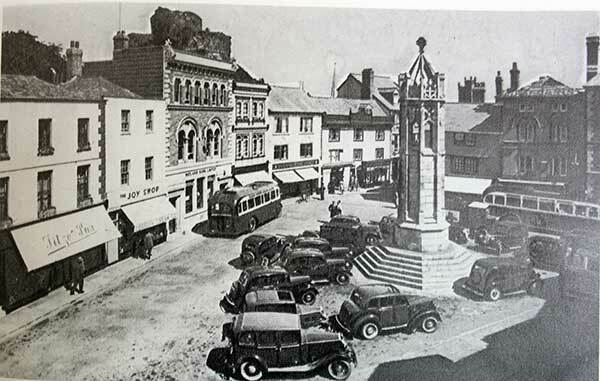 And so, Launceston’s square remained this way for the next 80 years, although with the advent of the motor car it grew more congested with parking around the memorial and along the northern side of Broad Street. 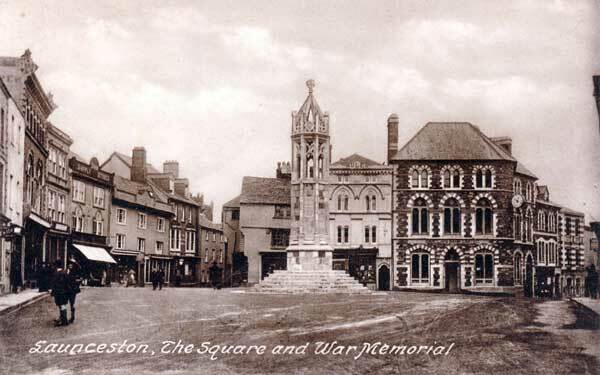 As part of the Launceston Townscape Heritage Initiative, the square was pedestrianised with the prohibition of vehicles on all but the northern flank of Broad Street. Although controversial, this has helped facilitate the opportunity for open air markets and other various events. 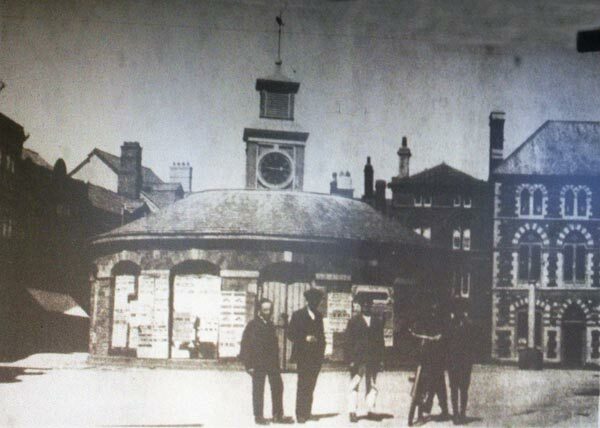 At the far end of the square lies an underground reservoir which was described in 1849 by an Engineer from Penzance as being ‘ancient,’ although there is mention of it as being a new reservoir in the 1789/90 accounts of the mayor, so it is likely to have been constructed around this time. 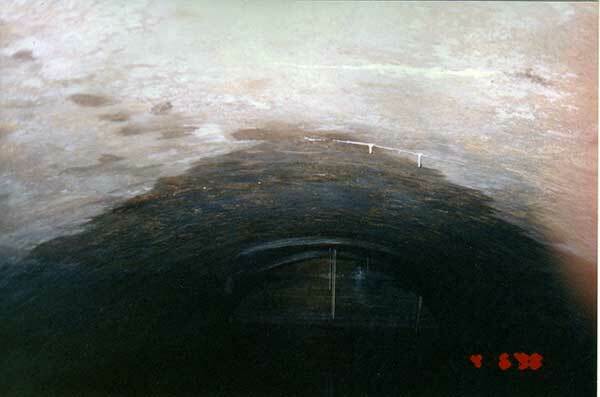 This reservoir still exists to this day with the Fire service taking responsibility for its maintenance. 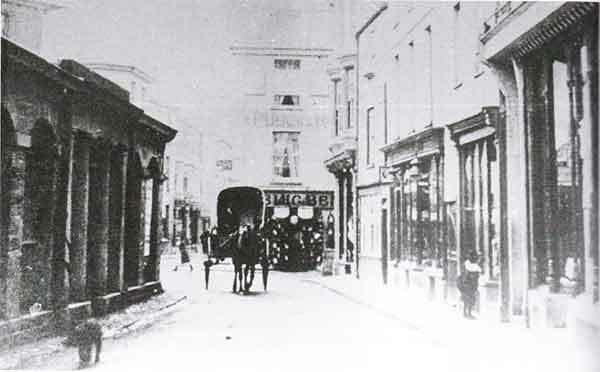 Nicholl, Elllacott and Lyons shops in Launceston Town centre c.1860's. 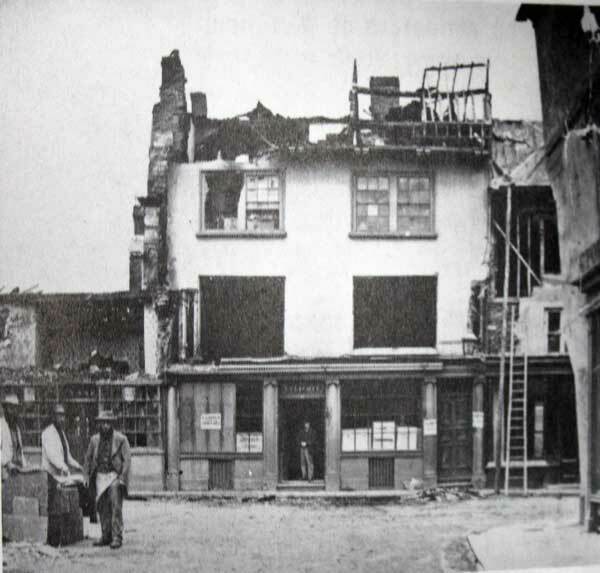 The aftermath of the 1875 fire in the town centre captured here by Henry Hayman. 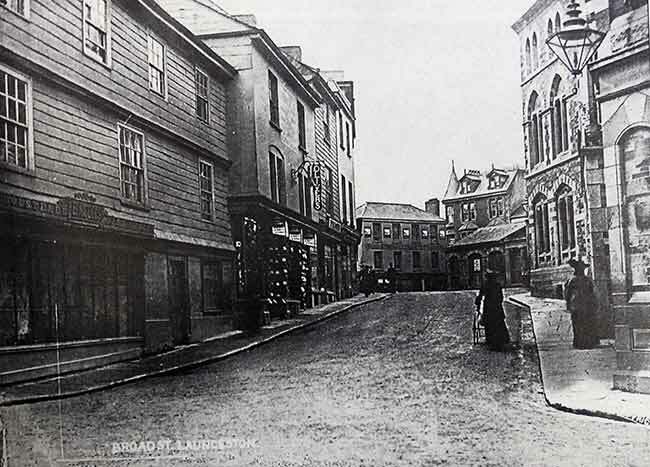 Back Lane, now Broad Street. 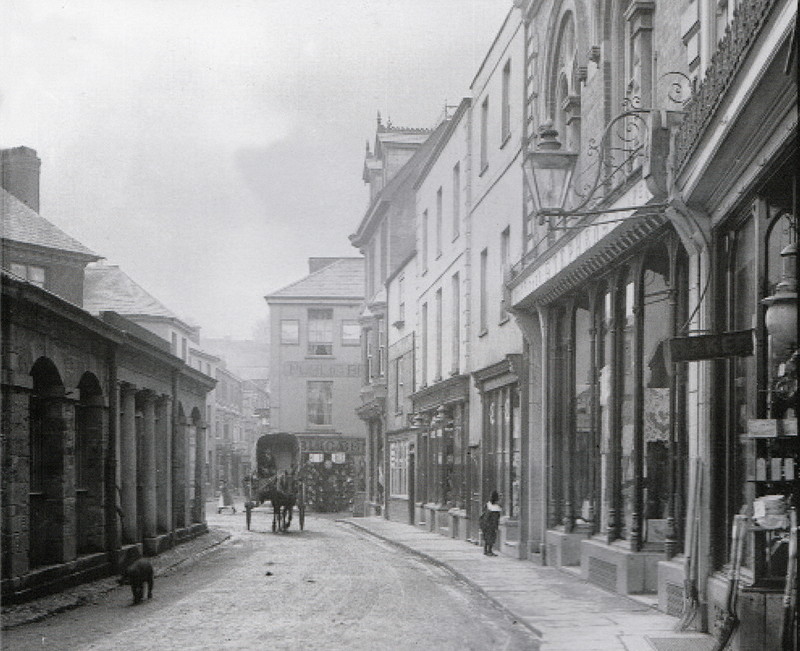 Back Lane, Launceston in 1909. 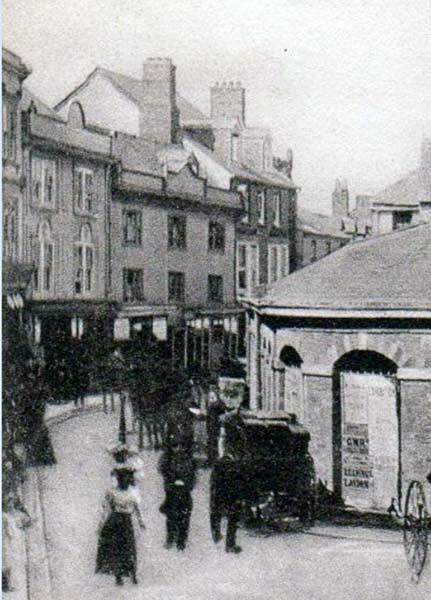 Launceston Town Centre from Church Street in 1890. 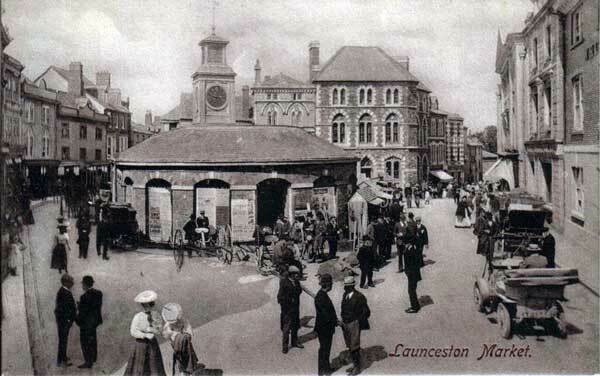 Launceston Town Centre c.1890. Photo courtesy of Ray Boyd. 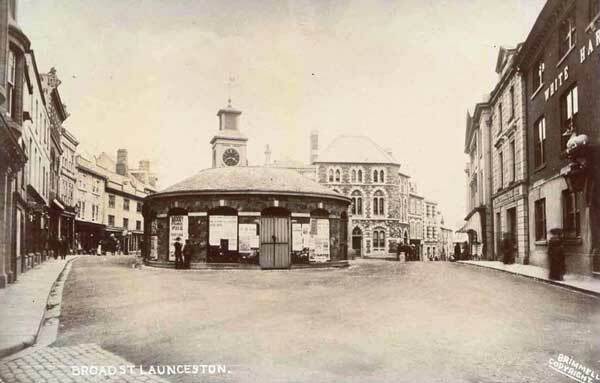 Launceston Town Centre c. 1890. 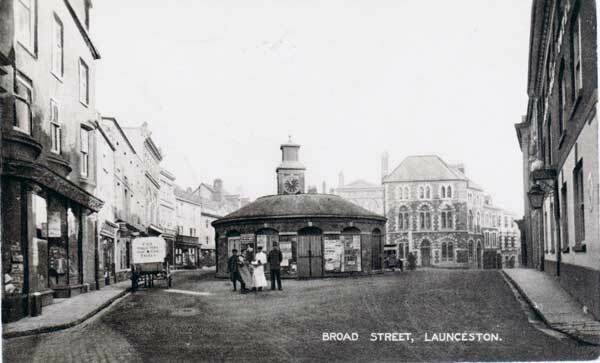 Launceston Town Centre c.1890. By Brimmells. 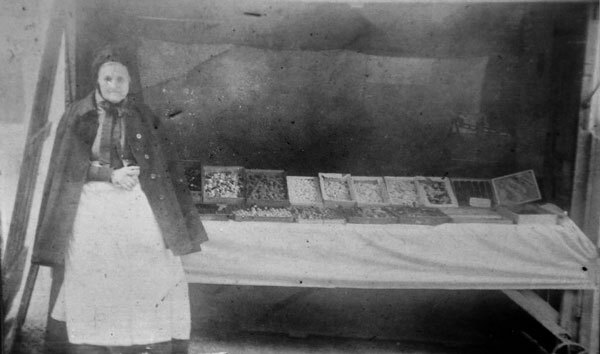 Granny Hicks on her stall selling sweets. 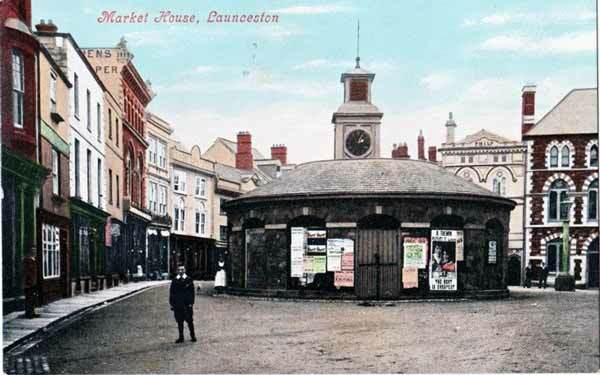 Launceston Town Centre in 1906. 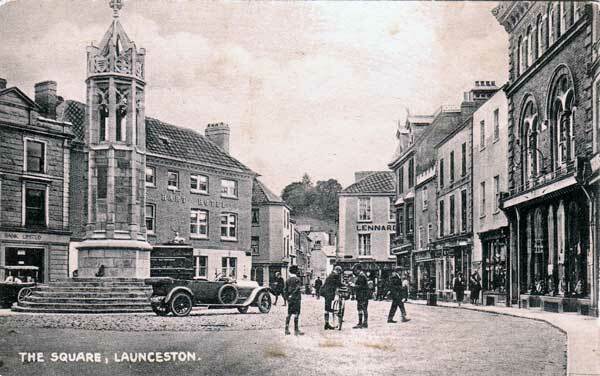 Launceston Town Centre c.1910. Photo courtesy of Ray Boyd. 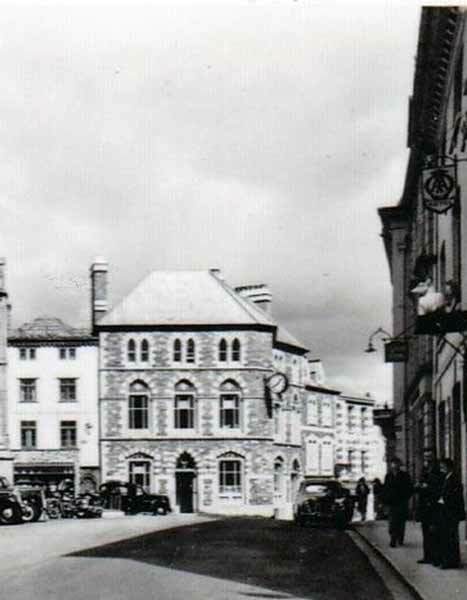 Williams Ironmongers Broad Street, Launceston in 1925. 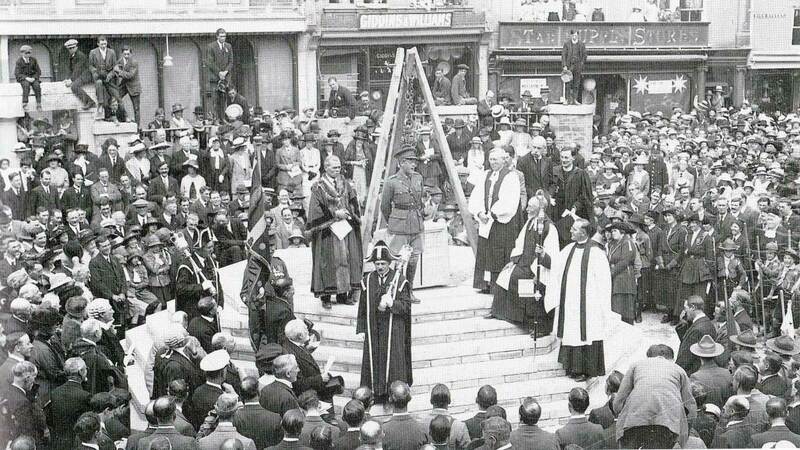 The dedication of the war memorial by the Lord-Lieutenantof Cornwall Mr. J. C. Williams in October 1921. Also in the picture are Mayor James Treleaven and Sir George Croyden Marks M.P. 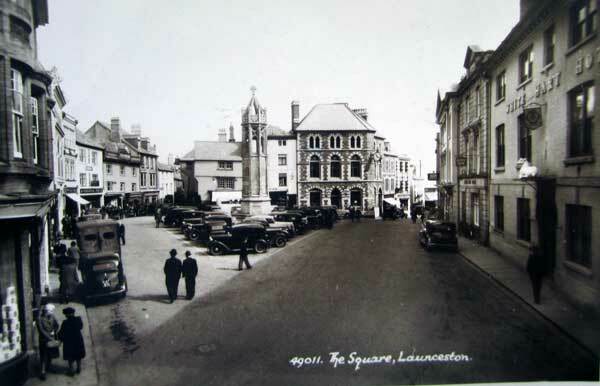 Launceston Town Square in the 1920's. 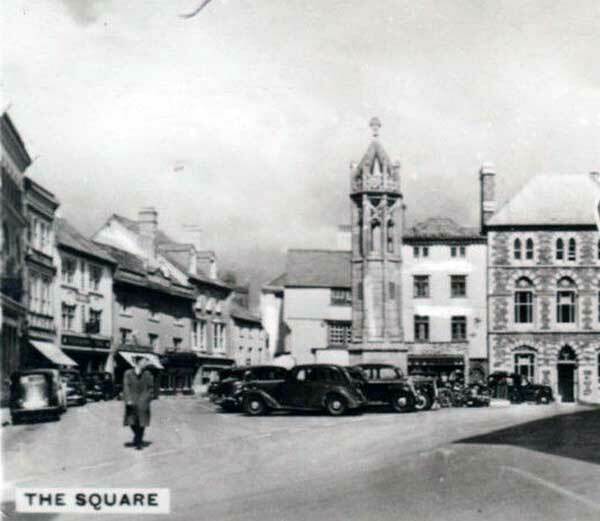 Launceston Town Square in 1925 with Dunns, Robins, Wenmouth, Vennings, Stephens, Giddons and Williams. 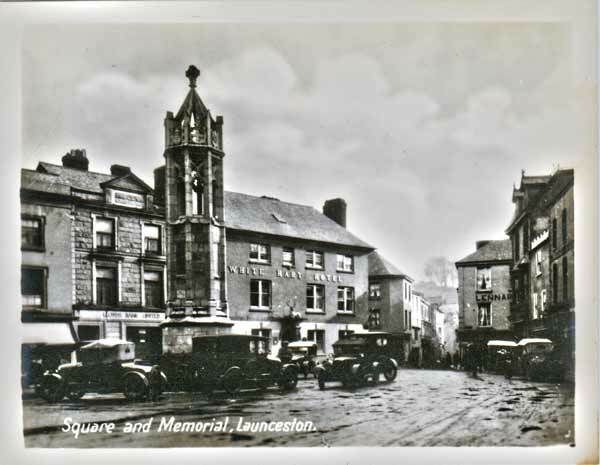 Launceston Town Centre in 1929. 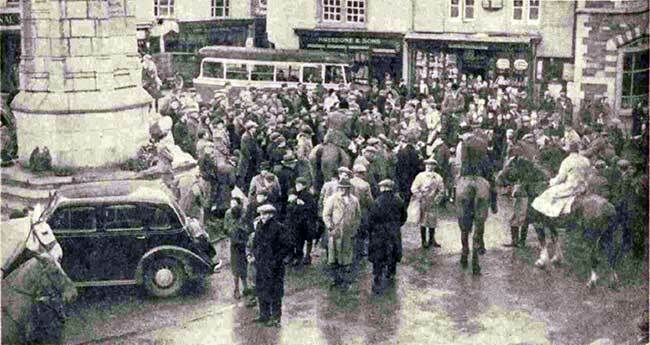 Lamerton Hunt meet on January 1st, 1937 in the Launceston Town Centre. 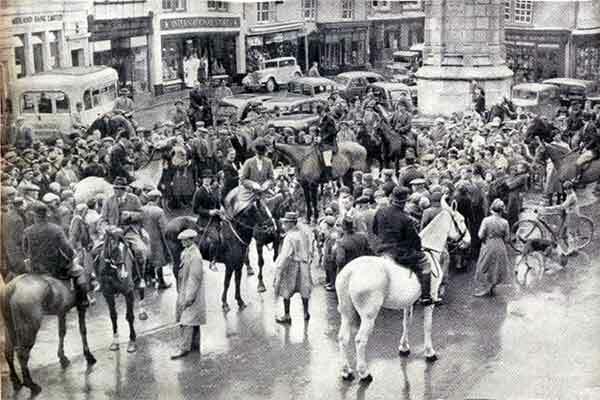 Lamerton Hunt meet on January 1st, 1939 in the Launceston Town Centre. 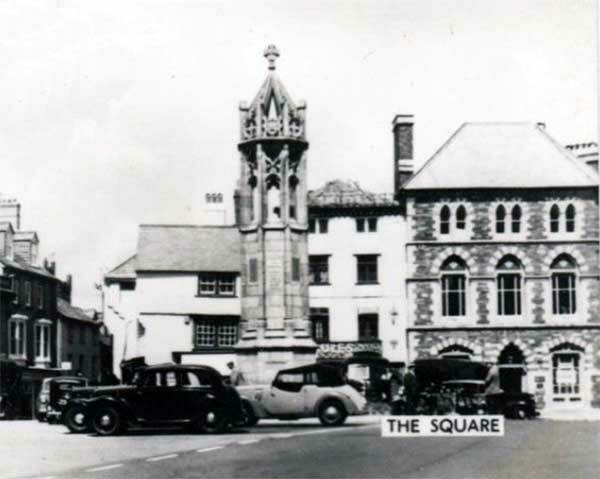 Launceston Town Square in the 1940's. 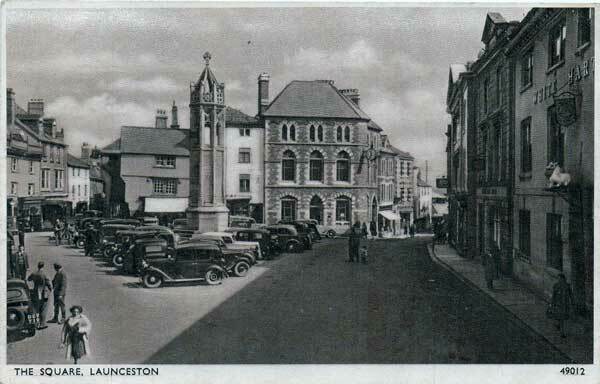 Launceston Town Centre in 1949. 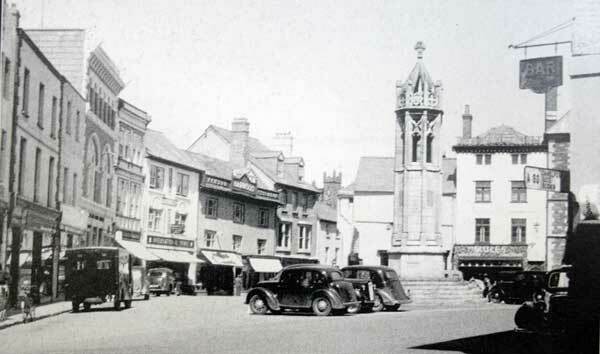 Launceston Town Centre in 1955. 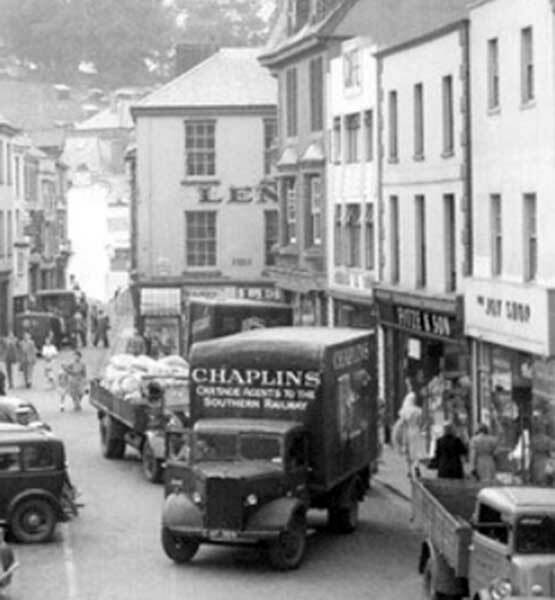 Launceston Town Centre in the 1950's. 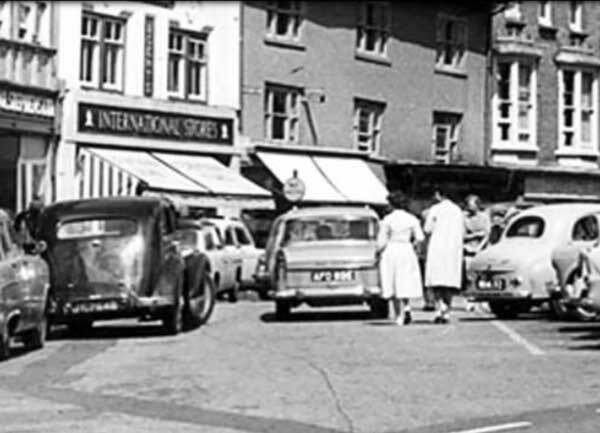 J. H. Stacey delivering to the White Hart Hotel in the 1950's. 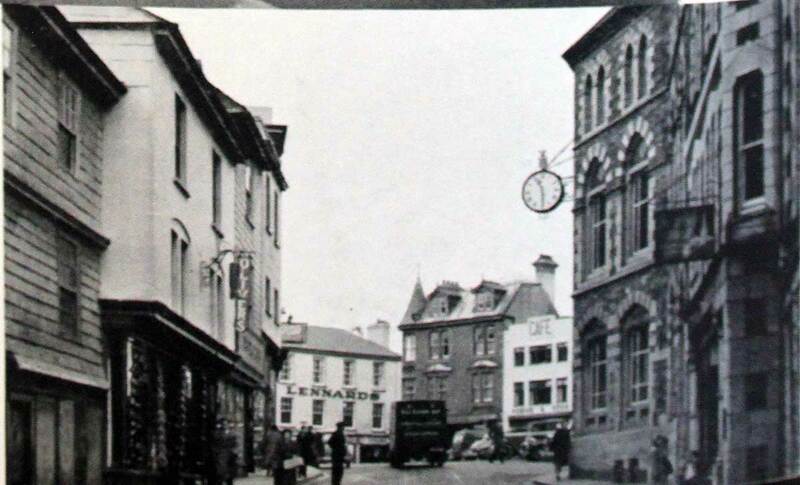 Launceston Town Centre in the late 1950's. 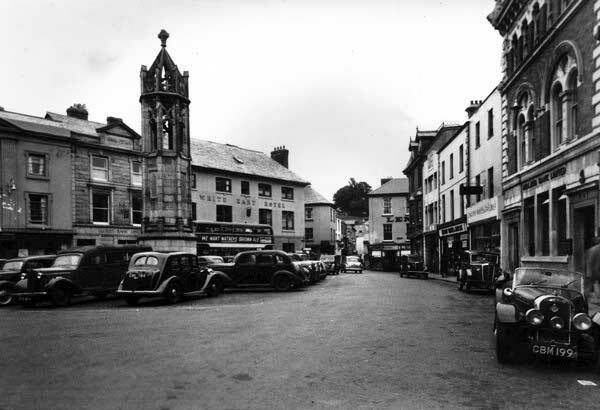 Launceston Town Centre in 1960. 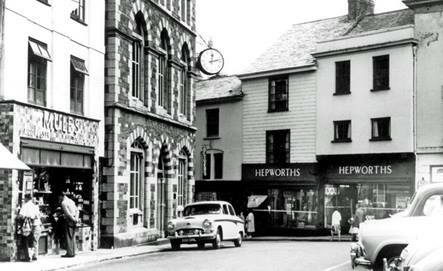 Launceston Town Centre in the 1960's. 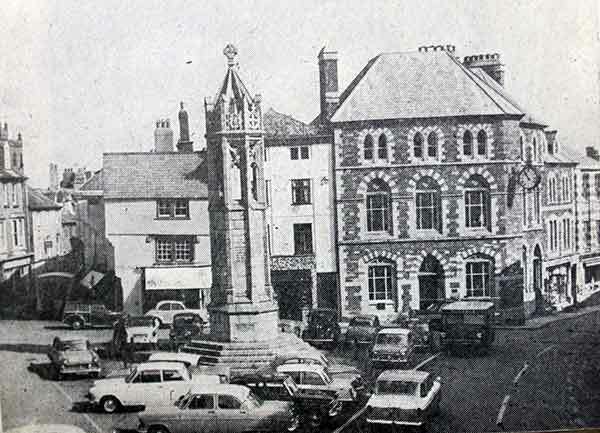 Launceston Town Centre in 1961. 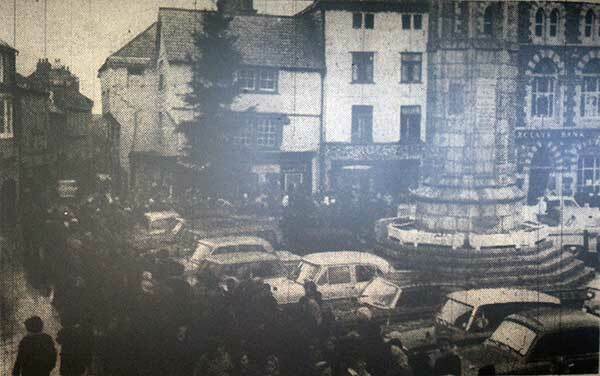 Launceston Town Centre Christmas 19968. 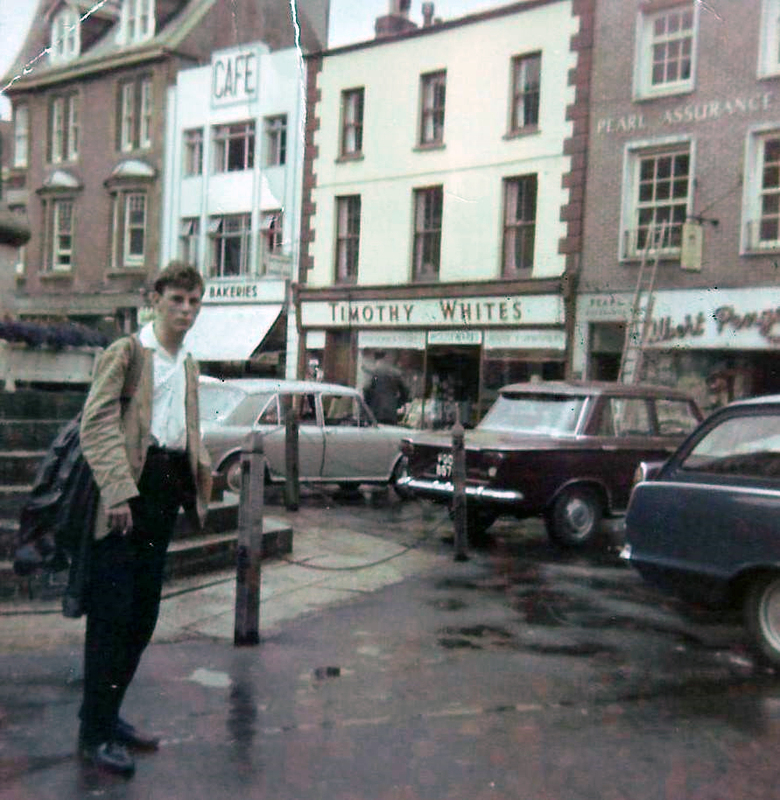 Tarry Barriball in the town centre in 1965. 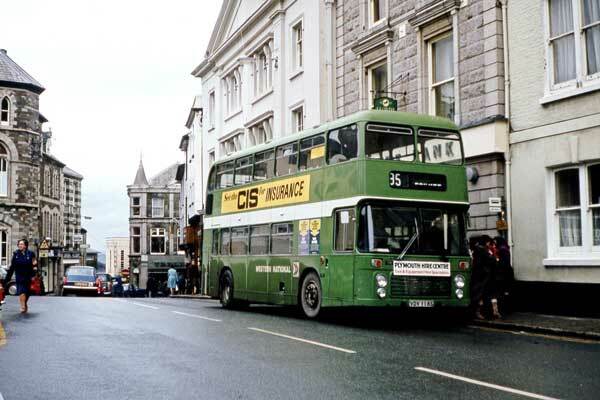 Launceston Town Centre in the late 1970's. 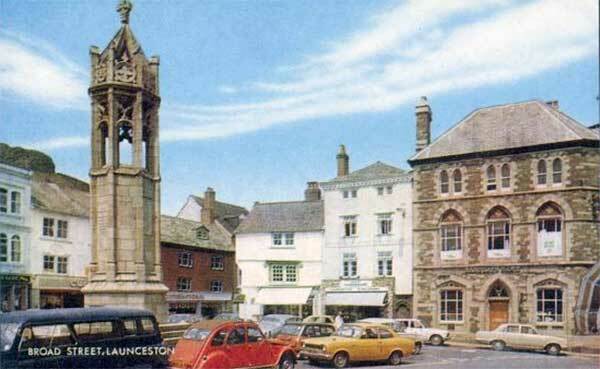 Launceston Town Centre in the early 1970's. 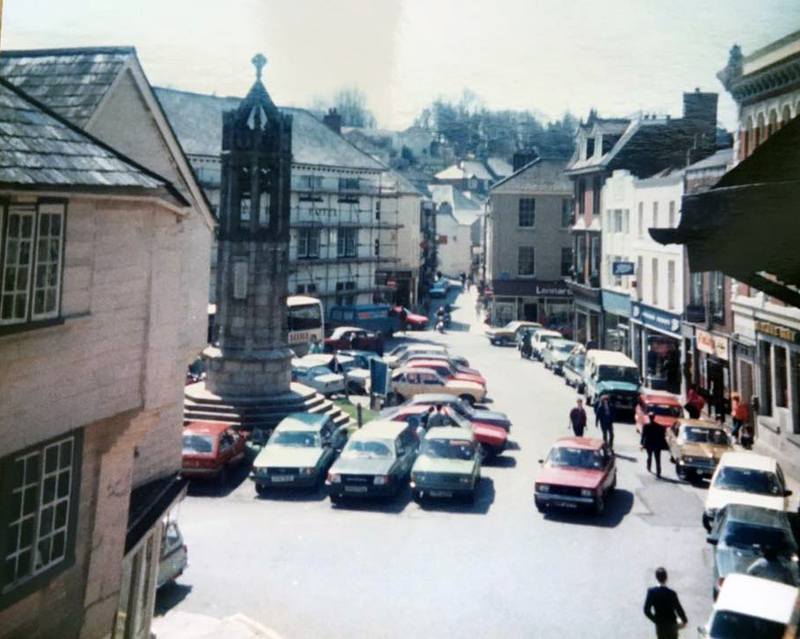 Launceston Town Centre in the late 1970's. Photo courtesy of Karl Jane. 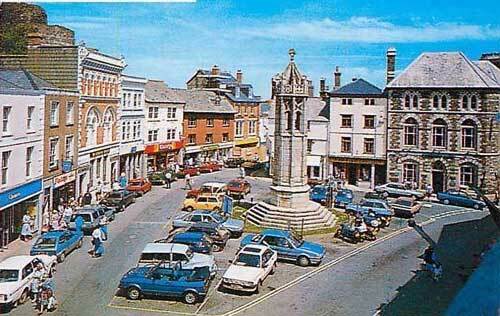 Launceston Town Centre in the 1980's. 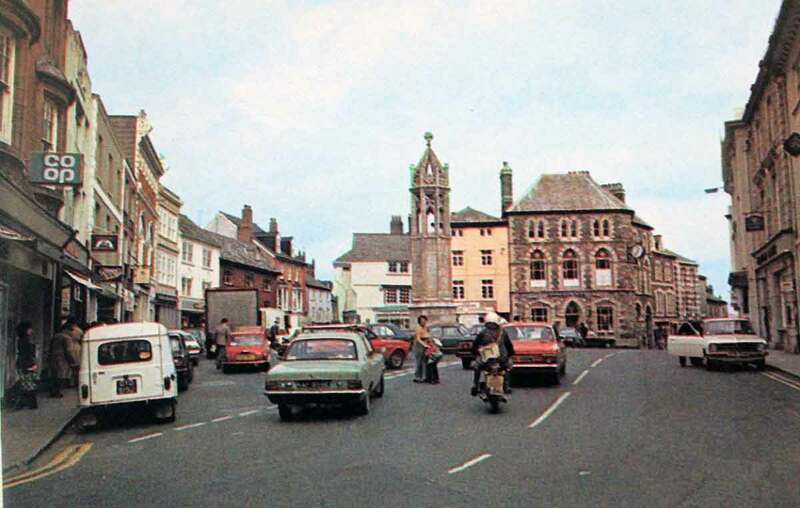 The Town Centre in 1982. 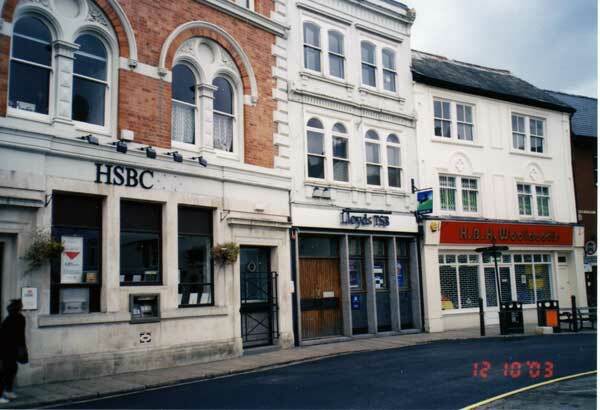 Launceston Town Centre in 1987. 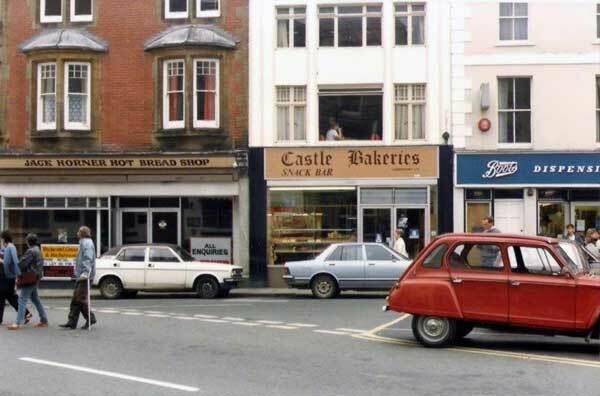 Launceston Town Centre in 1986. 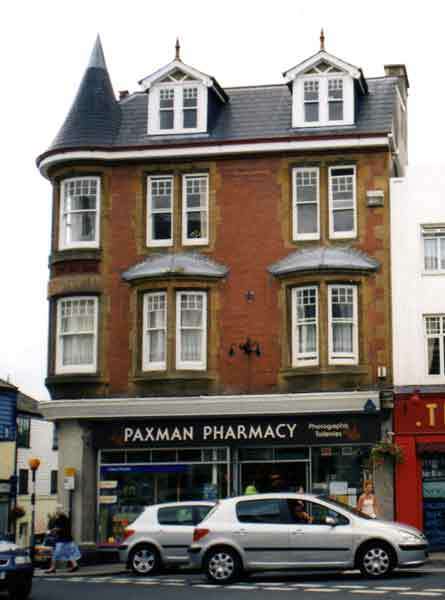 Launceston Town Centre in 2002. 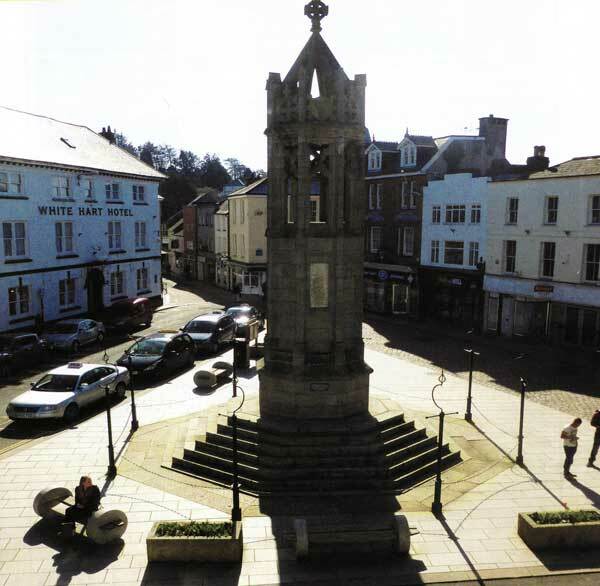 Launceston Town Centre in 2014. 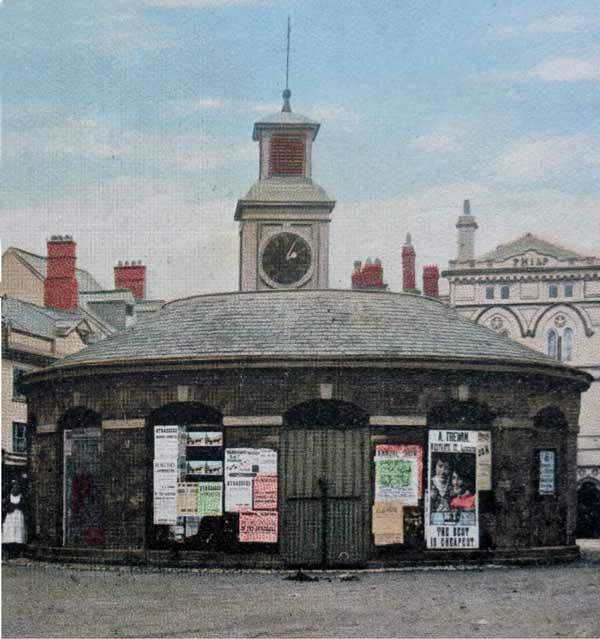 Launceston Town Centre underground reservoir.